Aviya is an online only company shipping innerspring mattresses directly to the consumer. I’m interested to see how it compares with other online-only innerspring companies considering it lower price. 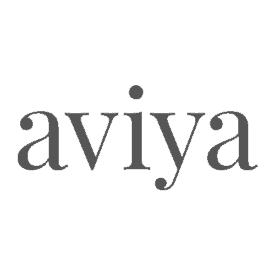 Want to find out if the Aviya is right for you? Read on for my full review! In a hurry? Click here to skip to jump to the review summary. In the mood for a buoyant innerspring? Then the Aviya could be for you! Get $100 off your purchase with our exclusive discount! Aviya produces a hybrid mattress, meaning they use a combination of foam and coil layers. The mattresses are made in the USA and are shipped directly from the factory to the consumer. The Aviya mattress is offered in three firmness levels: Plush, Luxury Firm, and Firm. 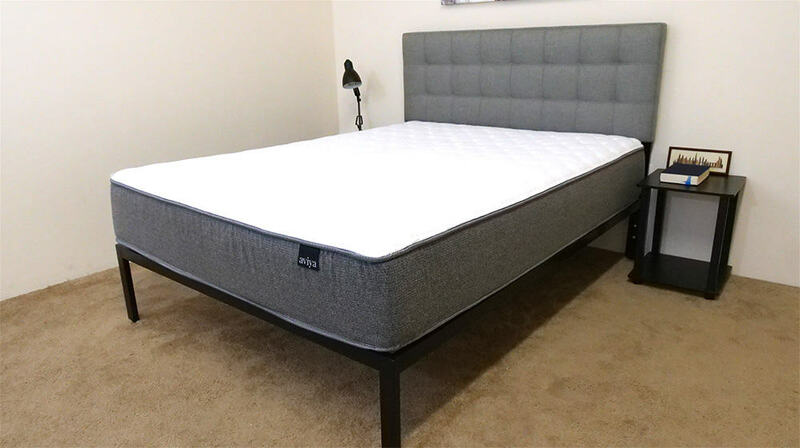 For this review I take a look at the Luxury Firm version, but all firmness levels contain a combination of foam and coil layers. The difference in firmness is achieved by using softer or firmer foam, depending on the intended goal. Cover – The cover is made of organic cotton, and I found it to be soft and breathable. It’s quilted with 1 inch of high density poly foam with a 1.8 lb density and 20 ILD. This quilted layer provides some initial cushion and pressure relief to the mattress. Comfort Layer – The comfort layer of foam in the Aviya mattress has a 1.8 lb density and 20 ILD, a measure of firmness where the higher the number, the firmer the mattress. This layer will allow for some sinkage into the mattress in order to provide further pressure relief. Transition Layer – Below the comfort layer is a layer of foam with a 1.8 lb density and 35 ILD. This layer is a bit firmer to act as a transition from the softer foam layers above and the firmer support of the coil layer below. Coils – This layer of the mattress consists of individually wrapped coils, which provide support to the sleeper and give the mattress some bounce. Individually wrapped coils tend to be good for isolating motion, which we’ll take a look at later in the review. Coil layers such as this are also good for temperature regulation, as they create space allowing for airflow through the mattress. Base – Underneath the coils is a 1 inch thick layer of high density poly foam (1.8 pcf, 50 ILD). This layer is the foundation of the mattress and is what the coil support system rests on. Edge Support – There is a 3 inch thick shell of high density poly foam (1.8 pcf density, 50 ILD) that runs around the outside of the coil layer. This part of the mattress provides edge support to defend against the mattress collapsing when pressure is applied near the side. I’ll take a closer look at edge support later in the review, but wanted to note that this portion of the construction should help the Aviya keep its shape. When I first press into the mattress, the initial feeling is of the soft quilted cover and the comfort layer below that. 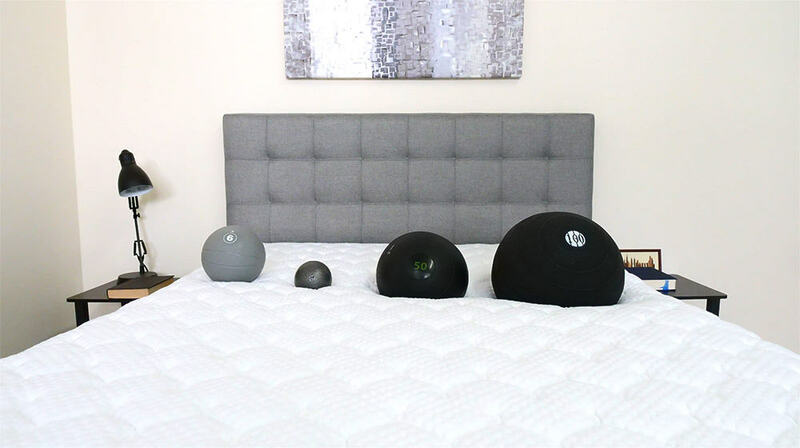 When I add some weight and increase the pressure applied to the mattress, I begin to feel the firmer support of the lower layers of the mattress and the springiness of the coils. Even though the mattress does contain some foam layers, I would say the Aviya has a traditional innerspring feel. Everyone will feel the firmness of a mattress a bit differently, because of variations in body type and weight distribution. Rather than just giving you my opinion on the overall firmness level, I brought in three other testers to their opinion. 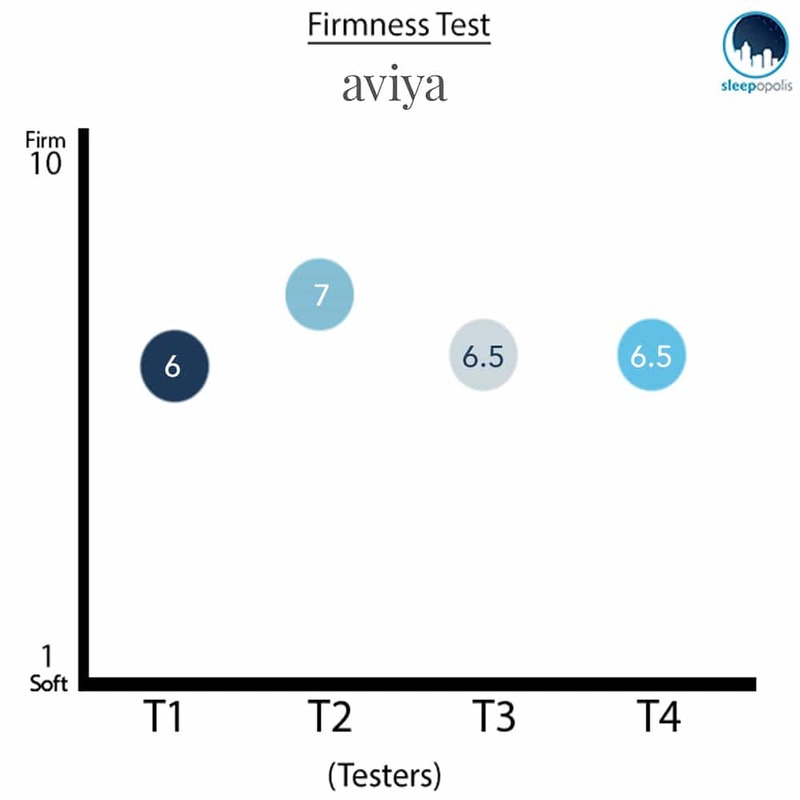 This will give you a better sense of the firmness range you can expect from the Aviya. As you can see from the chart above,the responses from the testers averaged out to 6.5/10, which is generally thought of as the mark of medium firmness. A mattress in this firmness range will allow most people to sleep comfortably in multiple positions. I felt that the Luxury Firm version of the Aviya is in the medium firmness range, which means that it will appeal to a wide array of sleepers. This type of feel is a solid mix of pressure relief and support, so it works for multiple sleeping positions. I found the Aviya to have a good amount of bounce to it, which allowed me to adjust my position easily. To go along with my description of the feel and firmness of the Aviya, I wanted to give a visual representation of where someone may feel pressure points while lying on the mattress. To do this I placed a pressure map on top of the Aviya and lied on my back, side, and stomach. On the image below pressure will be represented from blue (low pressure) to red (high pressure). Starting on my back on the Aviya, I initially feel the foam in the cover and comfort layer allow me to sink into the mattress slightly for some pressure relief. In this position my weight is pretty evenly distributed and the pressure map shows low pressure across my entire body. One place where this is especially important for back sleepers is the lower back, where I felt the bed fill in the space, to provide lumbar support. While I did sink into the Aviya a bit, the coils system provided good bounce, so I didn’t feel stuck. Side sleepers tend to feel increased pressure, especially at the shoulders and hips, due to increased weight concentration over a smaller surface area. The pressure map here shows a slight increase into the green range, but that is pretty good result. If you are a strict side sleeper you may want to take a look at the Plush version of the Aviya, as it would provide further pressure relief, however this is a good result if you only occasionally sleep on your side. Once on my stomach, my weight is again evenly distributed and the map shows low pressure across my body. This low pressure was a plus across my chest as it allowed me to breath pretty easily. I found that the coil support system did a good job of keeping my hips out of the mattress to keep my back in a good position. Stomach sleepers often prefer firmer mattresses, so if you are a strict stomach sleeper or a bit heavier you may want to check out the Firm version of the Aviya. 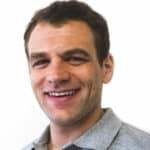 If you plan on sharing your bed with a partner, you will want to know what it will feel like when the other person gets into and out of bed or tosses and turns during the night. 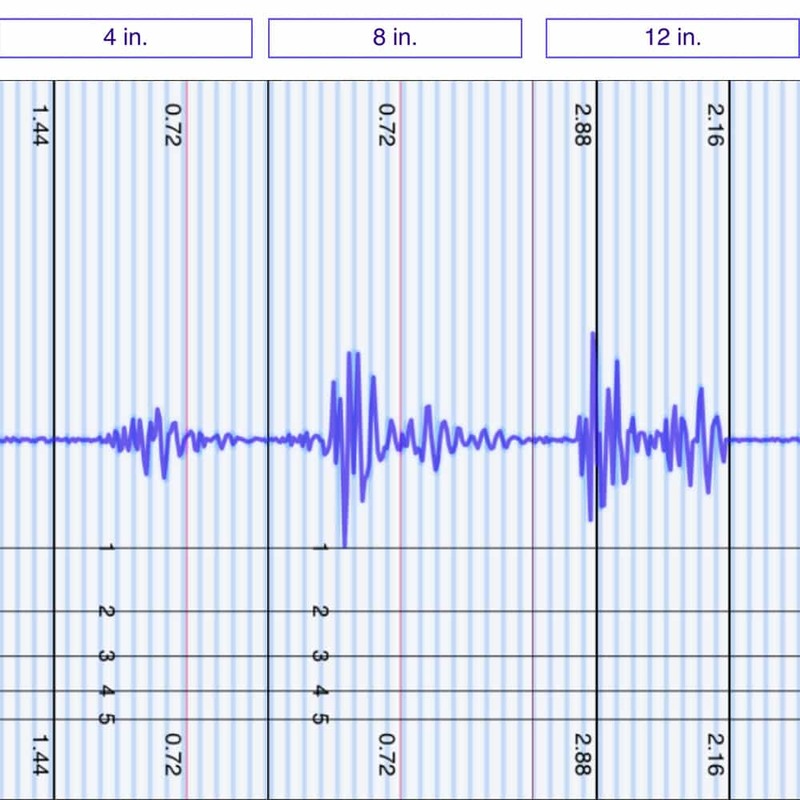 This next test is helpful in showing the intensity of motion that is detectable from one side of the Aviya mattress to the other. 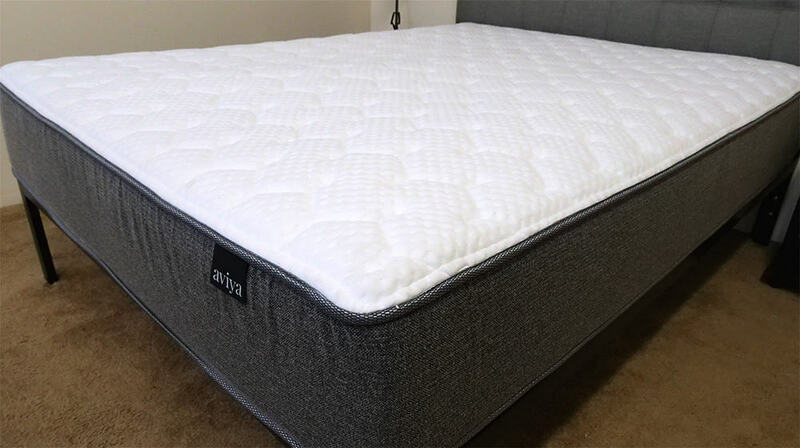 The Aviya performed very well on the motion transfer test, with the 4 inch drop showing almost no disturbance felt across the mattress. The 8 and 12 inch drops show slightly higher disturbance, which is to be expected, but both are great results for this test. I was pretty impressed by the performance of the Aviya on the motion transfer test and would say it is a benefit to anyone that plans on sharing their mattress with a partner. Many people will want to know if they will have the feeling of lying on top of the mattress, or sinking into it. In order to get a good idea of how far into the Aviya someone might sink, I used four balls of varying sizes and densities (a 6 lb medicine ball, a 10 lb steel ball, a 50 lb medicine ball, and a 100 lb medicine ball) and place them on the mattress to measure how much they compress the surface. 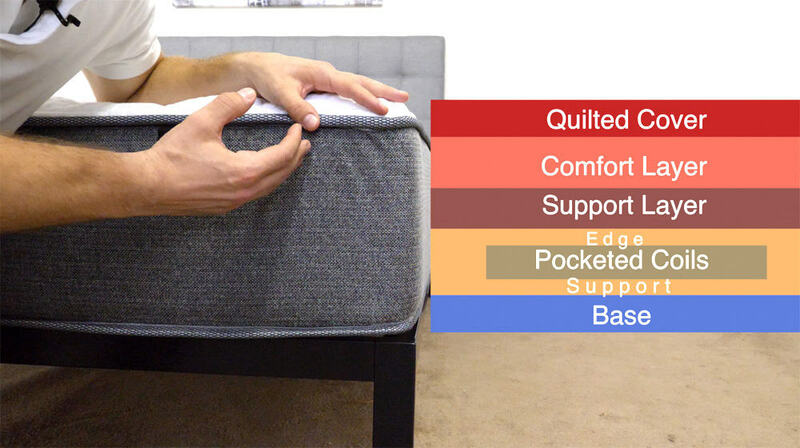 If you’re going to share your bed and need to use the entire surface of the mattress, then edge support is something you are going to want to take a look at. Aviya included edge support foam around the outside of the coil layer, to give some stability to the structure when lying near the side, and I’m interested to see if there is notable support near the side of the mattress because of this. Lying on my back near the edge of the Aviya, I felt even support from the center of the mattress to the edge. You can see in the image above that there is a bit of compression through the quilted cover of the mattress, but the edge support foam does a great job of supporting my weight and keeping the shape of the mattress. While lying on my side, the Aviya again does a good job of supporting me near the edge of the mattress. I never had the feeling that I would roll out of bed, even when hanging off of the side of the mattress a bit. When I sat up on the side of the mattress (think putting your shoes on in the morning or getting into bed at night), my weight is concentrated over one area of the Aviya mattress. This position does a good job of showing how the mattress responds to increased pressure on the edge of the bed and the Aviya does a great job of holding up. Overall, I would say that the edge support foam included in the construction of the Aviya did a great job of helping the mattress keep its shape when pressure was added near the side. Sleep Trial: Aviya offers a 100 night sleep trial. Warranty: There is a 10 year warranty on this mattress. Shipping: The Aviya mattress ships free, but only to the continental United States. Convinced the Aviya is the right mattress for you? Use the code SLEEPOPOLIS100 for $100 off your purchase! Is the Aviya Mattress right for you? Now that we’ve taken a closer look at the Aviya mattress, it’s time to discuss who I think it would be a good fit for. Sleep in multiple positions – The Aviya Luxury Firm has a medium firmness to it, so it should provide a good combination of support and pressure relief for a wide range of sleepers. Also, the coil layer provides good bounce to the mattress, meaning you won’t have the feeling of being stuck in the mattress when adjusting your position. If you do have more specific sleep preferences regarding position, please note that there are softer and firmer versions of this mattress available. Innerspring feel – This mattress would be a great fit for those looking to buy their mattress online, but still want the classic feel of an innerspring mattress. The coil layer provides the bounce and support that many expect from a traditional mattress construction. If you’ve had success with spring mattresses before, you’ll feel right at home on an Aviya. Couples – The Aviya performed very well on the motion transfer portion of the review, with minimal disturbance seen for all drop heights of the test. Along with that, the construction of the mattress includes 3 inch thick edge support that wraps around the coil layer to provide stability along the side of the mattress. Strong performance in both of these review portions is a good indicator of being a good mattress for couples.